ON THE TRACKS OF BB. THUNDER isn’t what it used to be. In the Seventies and Eighties it was not unusual to experience summer evenings of almost unbearable humidity, especially in June or July. And in those evenings, of distant but approaching rumbles and bruised purple clouds on the horizon, I could often be found fishing for carp at “Cables Corner”. This was not a pool, but a humble bend in a country canal where antiquated power lines, held up by wooden telegraph poles, were sagging overhead. Day and night, they hummed almost inaudibly to themselves. On warm late afternoons that low electric hum, and the drone of the midges above the sun-browned ferns, added much to an atmosphere of tense expectation. I revisited “Cables Corner” recently and found a neat, trimmed towpath and, worse still, “No Fishing” signs. The antiquated power lines were still there! Apparently, I must have tempted the Grim Reaper on most summer days, during my youth, for anglers who fished beneath the hum were risking imminent electrocution. It said so on the new metal signs, so it had to be right. There was even an interesting picture of an angler being punished by a thunderbolt. The truth is, while the use of a roach pole could indeed have led to the savoury scent of roast angler, my companions and I only ever used rods of 10ft or so, and all our casts were under-arm. We never felt in any real danger, although I suppose it is conceivable that we were. Back in our day, I am certain that many years could pass by without an inspection from the Electricity Board. After all, even to cycle to Cables Corner was a precarious business, for the towpath was at a slant and it would do its unlevel best, here and there, to crumble into the bubbling green margins. I realise now that it was this level of neglect, and the relative lack of a human presence, which attracted carp to “Cables Corner” in the first place. I only know I loved the spot, with its high bankside ferns and snagging, obstructive hawthorns. It had to hold big fish. We were certain of it; and although exaggeration isn’t what it used to be, I am still fairly certain that the largest fish in the canal were never caught, although they were hooked. One autumn day, for instance, my brother David float-fished worms by the bulrushes and found himself attached to three large carp, one after the other. I call still recall his float simply disappearing and the alarming bend of his fibreglass rod. Two of the carp threw the hook while the third, obviously a real whacker, simply swam away - slowly, so slowly from the pressure, until the 8lb line could bear no more. Later, by the mid-Nineties, he would have a string of canal doubles to his credit, (including a 32 inch long, rather tubby common which he did not weigh), - and his near success that autumn day was a wake-up call for me, and him, that genuine “monsters” might be a real possibility. Then there was the mirror that was caught by a fishing friend, Martin. It had been a hot sunny day, and I felt disinclined to fish, for some reason. However, I kept Martin company as he set out with a Tony Fordham carp rod, Mitchell 300, his 24 inch landing net and a bag of crusts, in search of action. He found it alright, close to Cables Corner, where every carp in the stretch seemed to be on the top. If my memory serves me correctly, he was only using 6lb line – Bayer Perlon, I think, - notorious for being stretchy. But this stretchy quality would prove to be invaluable on that occasion. He soon had a take, and he was soon broken. The line stretched and failed with a sharp retort, like the firing of a starting pistol. Looking back, I think that first fish was close to being a twenty. Martin had another fish on! This time round, his quarry was content to plough up and down the middle channel while avoiding the bulrush beds on the far bank. Then the game changed, suddenly and without warning. The hooked fish hammered into the bulrushes. His rod was high and we watched, horrified, as the 6lb Bayer stretched again impossibly – impossibly, while the mirror bored deeper and deeper through the rigid stems. At the time, I had caught few carp; my experience was limited, but somehow, instinctively, I knew it was the correct advice. He followed the advice and slowly, painfully for the two human beholders, the fish left the bulrushes. We had no balance, (typically!). But we measured it at 24 inches; and it was a fat mirror too, and therefore, with hindsight and experience, I would set its weight at 13lbs or so. At the time, it was the largest carp that I had seen on the bank. I would like to report that, on the humid evening I have in mind, I finally captured my canal monster. But it was not to be. 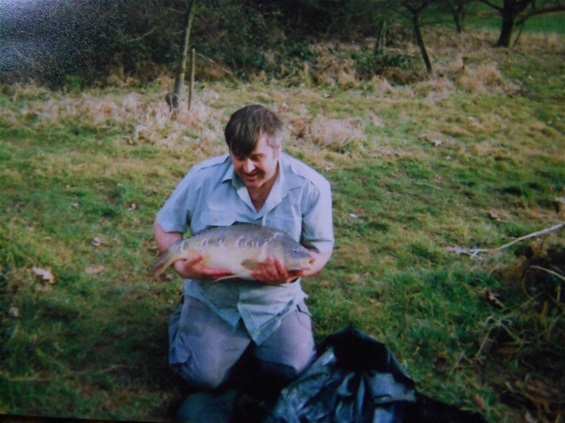 However, the carp that I did catch has remained in my memory ever since. I have often thought of thunder as a language. We listen because we try to understand it, perhaps. That evening, I did not grasp its subtleties, although a very small common leapt by my float and the entire canal was rocking. Deep, hidden fish moved to and fro above the dark silts. The thunder was hardly impressive. It was somewhere else, above the English Midlands, troubling other listeners with a profound anger. But the heat was stickily oppressive, while a myriad biting insects whined around my held. What else could I expect? I was fishing by the ferns. I had cast my quill close to a fringe of Canadian pond weed. The bait was a popped-up dog biscuit and I had “glugged it” in honey to add to the attraction. And suddenly my float wasn’t there anymore! I found myself attached to a cunning, almost irresistible force. I was mindful of the 6lb Maxima and let the fish run. I only applied heavy pressure when it swung towards the rushes. It was an often frustrating game of give and take. At last my carp was ready for the net. In those days I used a ridiculous 24 inch pan net with an aluminium frame, and it failed me at the critical moment, by collapsing with a loud bang. The metal had exploded, close to the brass screw! But the whole sorry contraption merely sagged down towards the bank, and the fish was still safe and sound, inside the folds of soft green mesh. Perhaps the broken net inspired me to overestimate the common carp’s size, or perhaps the creature had only just spawned; but I was certain that I had landed my first double. In fact, when weighed, it was only 8lb 10oz: but it was still an impressive fish, – almost as long as the pan net was wide, and with sturdy proportions too. Not one brassy scale was displaced, for my common in its Byzantine armour. However, the light was already fading quickly as I took two hasty snaps with my cheap camera. They were dreadful images, - vague and out of focus, and no match for my vivid memories. The built-in flash had not done its job, - not at all, and the last shout remained with the nearing electrical storm. As I returned my fish, a startling illumination revealed every surrounding blade of grass, every little hawthorn twig and leaf, with a burning magnesium brightness. And then, right on cue, the thunder roared above me, - a proper thunder, and a cooling rain began to fall at last. By Gary Bills. This article was first published in "Waterlog", summer 2012. 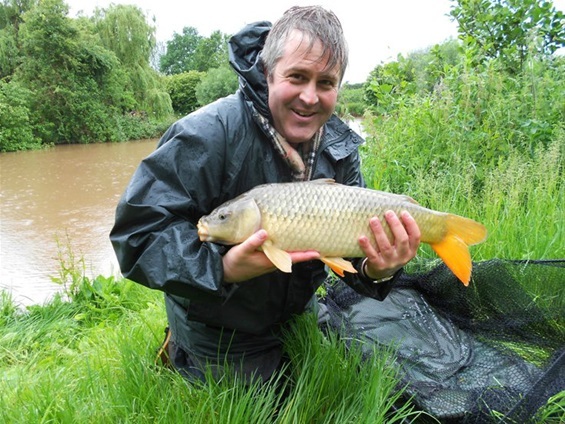 Picture above: I still get rather wet while fishing! Speaking of wet, believe it or not I'd fallen in just minutes before I caught this winter mirror! I was cold but happy! That sounds great - d'yer know - I haven't pike fished since 1998! Nothing like an estate lake for mystery and atmosphere!